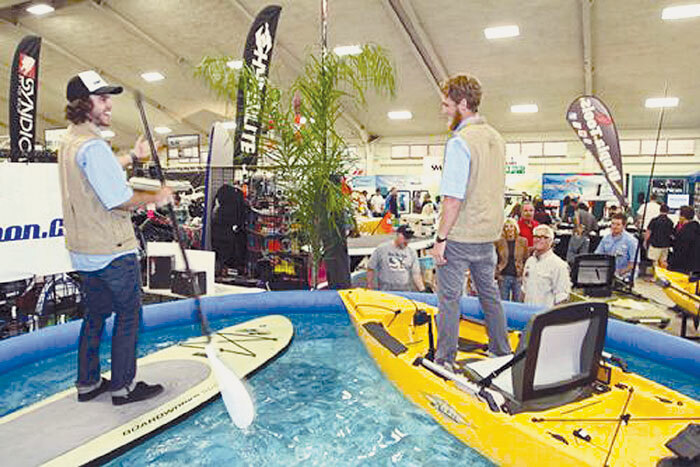 DEL MAR — The annual Fred Hall Del Mar Show returns to San Diego County March 21-24, giving sport anglers, boaters and other outdoor enthusiasts a chance to see what’s new in fishing gear, tackle and accessories — along with new boats, expert seminars, fun attractions, an expanded hunting and camping section, and much more. It all takes place at the Del Mar Fairgrounds, at 2260 Jimmy Durante Blvd. Be sure to visit The Log/FishRap booth, where you can sign up for a free digital subscription and e-newsletter to be automatically entered in FishRap’s Goodies & Gadgets Giveaway drawing. The grand prize is a Malibu X-Factor kayak — and daily prizes include rod and reel combos, fishing files, T-shirts and caps, Eagle Claw hooks, West Marine gift certificates, Sea Tow trial memberships and Baja Fish Gear lures and jigs. The drawing for the grand prize will be on March 25 — and the winner will be announced in the March 29-April 11 issue of The Log Newspaper. Winners do not have to be present to claim prizes. Fred Hall Del Mar Show hours are noon-8 p.m. weekdays, 10 a.m.-8 p.m. Saturday and 10 a.m.-6 p.m. Sunday. Admission is $13 for adults, $12 for seniors and free for retired and active military personnel, and children 15 and younger with a paid adult.